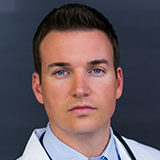 Dr. Christopher Calarco, D.C. completed his undergraduate studies at the University of Nevada Las Vegas where he received a Bachelor in Biological Sciences with an emphasis in Biochemistry. He then attended the National University of Health Sciences earning his Doctorate in Chiropractic Medicine. Dr. Christopher Calarco, D.C. is a strength and conditioning specialist who currently holds certificates in rehabilitation, physiotherapy, acupuncture, active release techniques, and Cox-Flexion Distraction. He is dedicated to a lifetime of continuing education on spinal biomechanics and musculoskeletal pathology and brings his considerable background in patient care to Accident Treatment Centers as Managing Clinic Director.